The Core SWX SPU-4 is a compact and lightweight 72 watt regulated power supply. 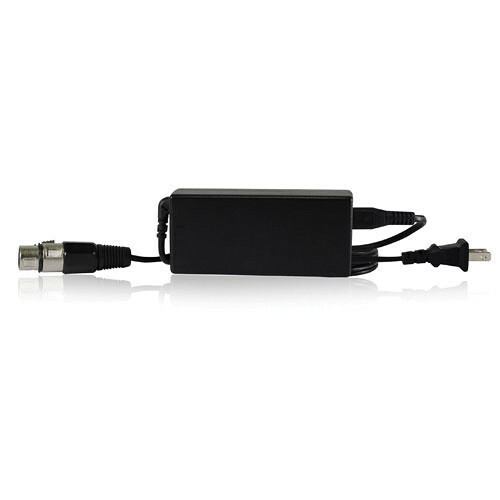 This device is easy to transport and it outputs power on a 4-Pin XLR connector for camera or DC light operation. At less than six inches long this unit is small enough to fit in a pocket for portable usage. Dimensions (WxHxD) 5.75 x 1.25 x 2.25"
Box Dimensions (LxWxH) 6.693 x 4.331 x 3.937"
SPU-4 Compact Power Supply is rated 4.6 out of 5 by 10. Rated 4 out of 5 by Alan from I like it. I had been using an old Sony power supply and the multicore-to-XLR4 cable gave out. I needed something quickly, and the small physical size was a major selling point, as space is often at a premium when traveling with gear. This works very well, and fits in the side pocket of my Porta-Brace case, compared to the old block-style unit I had been using. Rated 4 out of 5 by Brian from perfect for small lcd monitors i bought this for use with a panasonic LH90 monitor. love the small size, but the 4-pin lead could be a bit longer - but thats being really picky. Rated 5 out of 5 by Gabriel from WORKS GREAT-Powers camera via 4 pin xlr Works great. Powers my camera via 4 pin xlr.There were cheaper power supplies available off of @ but went w/ this Switronix one due to the brand name and the fact that it was powering such an expensive piece of equipment. Although the power supply comes in a branded Switronix box, the power supply itself is not labeled Switronix, which made me think that Switronix perhaps outsources this supply and it maybe the same ones that are on @ for 35USD. But better safe than sorry. I am happy with it. Rated 5 out of 5 by Joe from Great accessory for YAGH interface I purchased the LUMIX GH-4 with the YAGH interface last fall, and was baffled it came with NO POWER SUPPLY. Not only was it not included, I could find nothing about it on Panasonic's site or in the packaging that it came in. I was very frustrated until I found this gem. Works just as it should. Still scratching my head about why Panasonic didn't include this essential item, but Switronix came to the rescue. Rated 5 out of 5 by Sandy Gee from Works Great Bought this product to replace a broken power pack for a teleprompter monitor. It's solid, works fine & looks very similar to the original but is actually easier to 'click' in/out of the connection than the previous one I had. It's pricier than I'd hoped but nothing bad to report - very satisfied. Rated 5 out of 5 by RWM from House current to 12v via XLR made easy Relatively small and easy to transport. Label on the item reads MODEL 1206 though the B&H listing and the item's box read SPU-4. Great for worldwide travel. Powers my Panasonic GH4 and YAGH interface just fine. Very useful product at a good price. Rated 4 out of 5 by peter from compact, simple and it works Perfect power supply for my new professional Panasonic field monitor. Simple, compact and it works. A bit over priced for what it is, but I needed a power supply, and other cheaper units were special order. Rated 5 out of 5 by John from Full Power for a Low Price We are using this to power an older Panasonic AG-DP800 Supercam and it has no problems running from this unit. So far the unit has been solid an reliable. will this work with a Sony PVM A250 Oled? The Sony PVM A250 Oled works on straight AC only, no DC. Would this work with a sound devices 664 mixer? Unfortunately no and for two reasons. 1. The Sound Devices 664 requires a Hirose power plug, not the 4 pin XLR plug of the Switronix SPU-4.2. On a delicate electronic device such as the Sound Devices 664, I would not substitute anything that was not a OEM supply for fear of electrical damage. Will this power supply work with the Core SWX JP-V-FS7 V-Mount JetPack for Sony FS7 Camera? Dumb question, but this will supply power directly to the FS7 camera, right? If you have B&amp;H # COSPU4 connected to the FS7 this Power Supply will power the camera. The FS7 does not have XLR usually, but with the V-Mount JetPack it will have an XLR input for power. Will this work on the Panasonic YAGH Interface? Yes it works. We have two units working with YAGH. Will this power a NRG Varalux Professional Dimmable DC On-Camera Light - with 4-pin XLR Connector? I would check the the voltage and amps first. If that works out then you should be good.